This will be a short post, as I’m writing it in an underground bunker at the moment. Well not exactly a bunker, but we are below the ground surrounded by poured concreate. Maybe we can call it the Raven Lair. I’m lucky enough to have a partner who’s job both requires him to ride out hurricanes at work (making sure everything stays running) but also welcomes family and pets to ride out the storm in a safe location complete with generator, water and snacks. Maybe the internet will hold out long enough for me to finish this blog post. This week has been a long one of watching the weather channel and getting a crash course in armature meteorology. So as a category 5 hurricane barrels across Puerto Rico and Cuba, and heads toward my home in Florida along with all the other mundane hurricane preparations of boarding up windows and filling water cubes and the bath tub, there have been other less mundane preparations happening as well. Libations poured, offerings made, advice asked for and received. Now that everything is done and we are set up in the Lair, safe and waiting for the storm to do whatever it is going to do, I realize just how important my devotional work is to me. How interwoven and vital it is to my life. 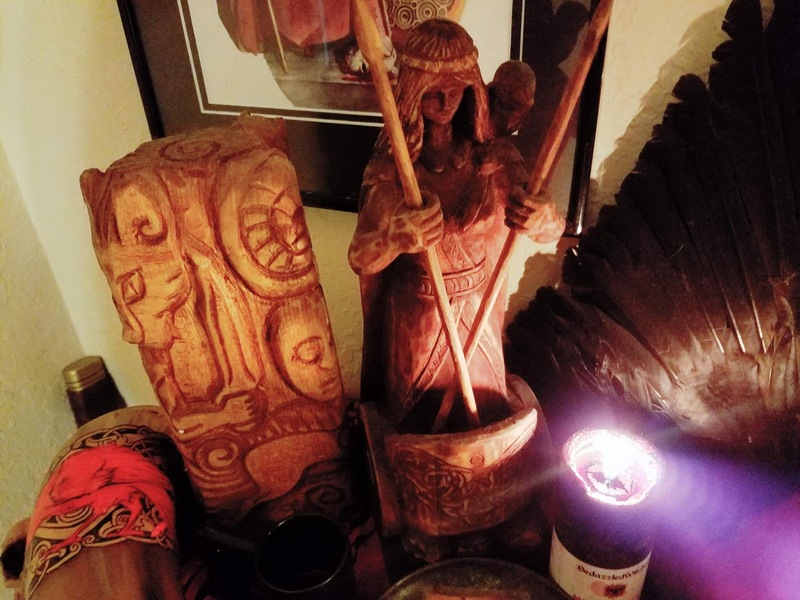 In between organizing food stores in the pantry I light the candle on the Dagda’s sprawling altar. It was much smaller at one point, and I had this incredulous image in my head of him with a raised eyebrow saying “Really? Me. I’m going to fit in this tiny space”. He has an entire shelf now, his items somehow have become sprawled out like that person who is a bed hog and just stretches and takes over the whole space. I pour him whiskey and ask Him to stand between us and danger. His cauldron which is a resin replica is fragile so I put it in the dishwasher so if anything does get through the windows it is safe. 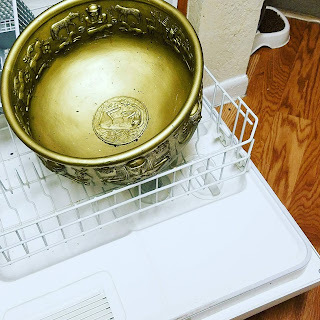 I saw a post online about putting photos and things you want to keep safe or from water damage in the dishwasher. Other people are putting photo albums in there, me I’m storing God Bling for safe keeping. We board up the windows and later that night I make offering to Hekate to guard the boundaries, to protect this place and those who dwell here. 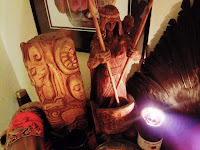 Each morning I made offering to the Great Queen, going through my usual prayer cycle and adding to it a prayer for protection written by Morgan Daimler. There are other offerings made, to Oya, to Brighit, and to all the Gods I have a deep relationship with. Its as vital to me and the practical things we are doing to prepare for the storm. Their voices are familiar, the prayers I say are familiar too, because I speak them often, they are a regular part of my life. And I realize how important these relationships are to me. Devotional practice is often a difficult subject to describe to others. By its very nature it is a very personal practice and each individual will go about it in a myriad of ways. In the end its all about building a relationship with the divine. Its not a 1-800 number to the divine vending machine, and its not a number you dial only when you need something. Building a relationship with a deity is a rewarding experience. Just like any other relationship you learn to recognize Their voice, likes and dislikes. The strength of that bond is carried with you in everything that you do. Devotional work, our relationships with the Gods, should be something that sees us through hard times. Its not just there on Mabon or Samhain etc, or the next Pagan festival. Its there all the time, fulfilling us, urging us onward and sustaining us as only the Gods can.